the shackles of a strictly car-based existence. Food, items packed back up, maybe a few things tossed in for the road; the crowd lining up and preparing their bikes from the backs of cars and vans.... yet, for the ones who arrived by bicycle, the whole event feels just a little more special. So, recently, when new-rando-guy Josh pinged me for approval to ride a permanent route of mine during a weekday afternoon, my left eyebrow slowly crept up my forehead in excitement at the brewings of true opportunity. Maybe he wants company?? Not quite the same as the "quick 30 miles" of the after-work rides of old, but, decidedly rando: 100km of goodness, on a familiar route... but, a route that I'd hardly seen from the beginning; explained: since my regular schedule has me awake WAY earlier for rides of any kind - especially when in summer "beat-the-heat" mode, I'd literally not seen the first 12 miles of the Border Patrol / or BPExpress route during daylight in probably 4 years... whenever the last post-sunrise start had occurred... which I can't really remember. You want to do this ride. Yes you do. 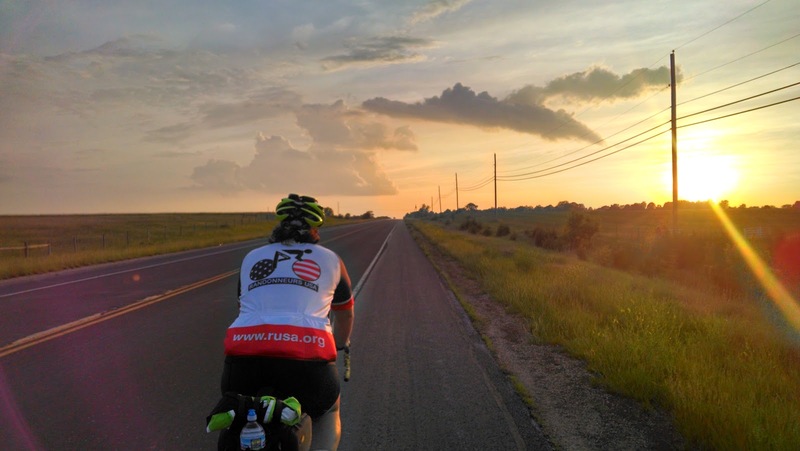 THIS ride is the stuff of rando-legend among all the myriad routes available starting at roughly 151st and Murlen in Olathe, KS., USA, North America, Planet Earth, Solar System 1, Andromeda Arm, Milky Way, Local Group 1, The Universe. OK ANY-how... shall we continue? So, the die was cast, the gauntlet thrown, all that jazz... Josh began the epic journey from Grandview to Olathe, and shortly after I saddled up from the office and joined him at the start location, ready to enjoy an afternoon of awesome. It's still technically Spring, yes -- but the summertime humidity of Kansas had come early. Good lordy the week had been swampy, and the 27th, a Tuesday, had been no exception. Thick with sweat already, we descended upon the hapless employees of the local Starbucks to gather the first receipts of the day, and head out with a gut full of chilled caffeine and flavor. The only detriment of the route during the daylight of afternoon would be the traffic. I swear, Olathe surely has multiplied in size again over only the last three years. Building projects abound, earth stands turned and cut, sewer lines waiting to be dropped in place, utility marks zigzag the pavement, and the shoulders of many - once quiet - rural roads have become strewn with gravel, mud and various sloppily forgotten shards of hardware. 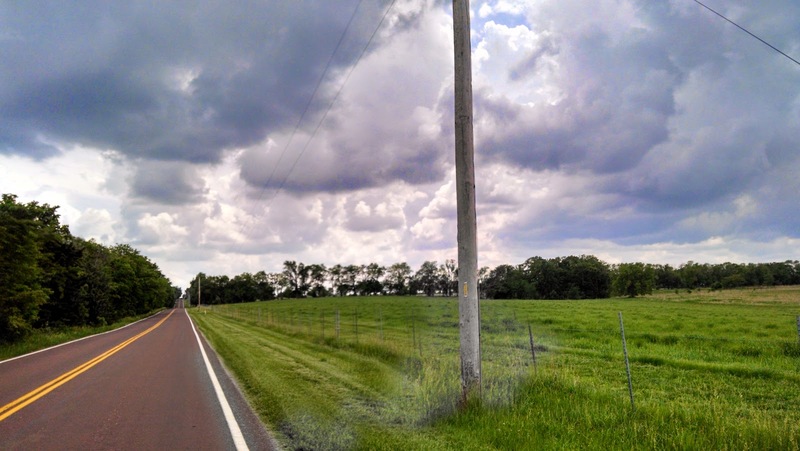 A rider's paradise, had the scene been a distant developing country (and I'd still disagree) -- but, suburbia grows like a cancer across pristine farm fields and undivided land, unchecked, unquestioned, and unconcerned with my opinions. I will always lose these battles; yet, watching from my front porch as "riding country" gets pushed farther and farther from my neighborhood becomes increasingly difficult to stomach each year - as do the attitudes of our new residents, their out-of-state license plates glaring at me - confirmation they have come from an alien world void of bicycles. Lest I continue to fade into the background reserved for those unsympathetic to the march of what some call "progress", I do my best to hold my tongue these days; just as I view "Suburbia 2 - The Search for More Real Estate Profits" as a bacteria scarring my idealist landscape, my angst against it and its attendant cynicism doesn't help me, my family, nor does it keep or earn me many friends. I need to do one of two things: shut the heck up, or start/join an advocacy group to ensure they don't forget about us as they proceed to repave everything - ...and then have the gall to still get upset when we occupy the fresh, new outer lane of whatever new four-lane road they'll create for their new subdivision. Of course.... all of this really depends on my mood, and beefin' about it at the keyboard won't change much. Okay, drifting off-topic again... dude.... really.... your pills. So, 175th/179th St. was a treat... manageable, and - despite what the ill commentary above would indicate, none of that occupied our conversation as we motored east along the route, smile wide and hopes high. A great day to ride? Check the calendar... ALL of em! After climbing the Col Du Arboretum on Antioch, it was nice to quickly bid farewell to the traffic behind us, the roads suddenly quiet and serene. Here, looking west along the roadside, once again it seems as if we've beamed to another realm. Thick, low clouds, high humidity... Josh and I were soaked with sweat already, and the ride had hardly begun. Looking south a moment later - it's a terrific afternoon for a good ride - the clouds seem the threaten rain, but, they also provide a modicum of cool shade as we huff and puff the early grades of the course. With each passing mile along the "should be familiar" roads, it continued to occur to me that these early miles had almost always been covered by me in the dark of pre-dawn. 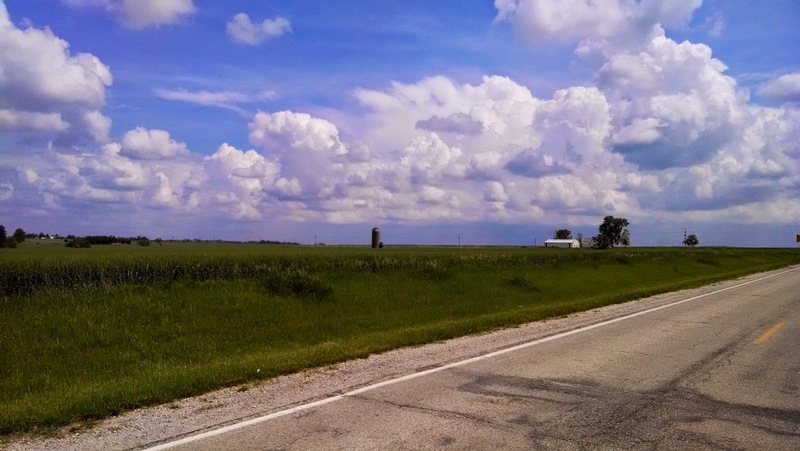 I'd never really noticed that silo or that barn - and with the lush greens and sparkling blues offset by postcard-quality clouds, the scene appeared nearly dreamlike, drawing my gazes longer. For such pedestrian roads, covered by these wheels several dozen times, I found myself reaching for the camera quite a bit more than usual. A bit later on along Metcalf (Old US-69) the scene continues to improve. Traffic is forgiving as most are still at work, and school traffic is gone, with the summer season in full swing. After all, it's too expensive to drive around aimlessly as a teen . . . at least, I imagine so. To the right, an inviting gravel turn-out beckons to the west... but, we stay focused on the route at-hand. 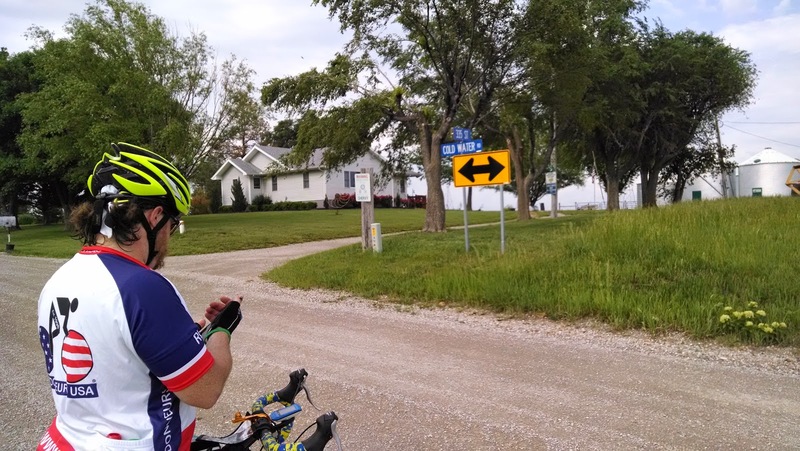 Gravel has been calling lately; tales of the Flint Hills and hopes for a fresh goal have me thinking - and this route in particular adds a small taste of training. 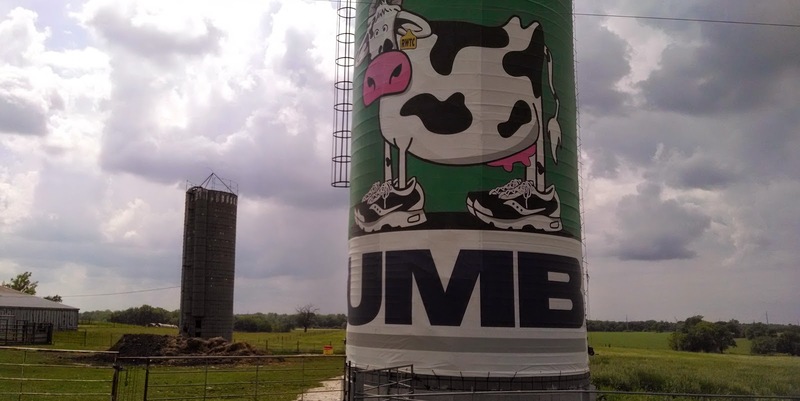 United Missouri Bank - a long-time Kansas City fixture - sponsors many summer running events, this one advertised on a large scale, affixed to a silo right along Metcalf near Wea, KS. ; an absolutely gorgeous little town tucked away south of Stilwell. Towns which, if you were new here, you'd likely never heard of, nor will hear about, sadly. 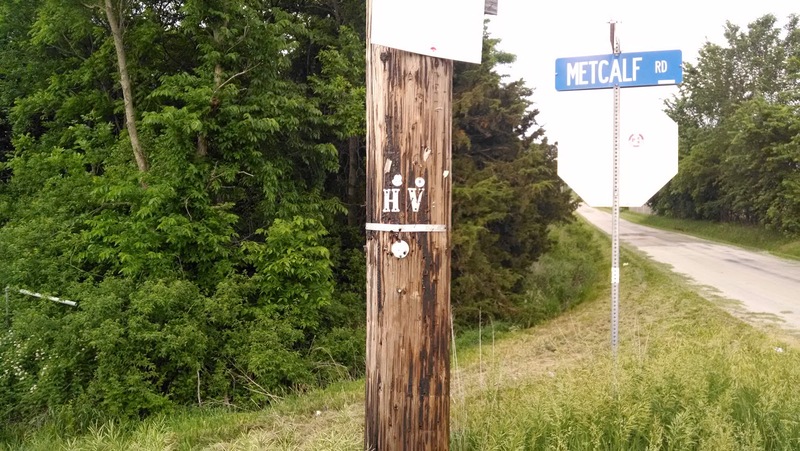 I still remember when the highway department removed the "Aubry / Stilwell " sign from the side of "new" US-69. Sigh. I'm too young to be this old. Full of youthful enthusiasm and a hearty shout, Josh motors along just behind me as we head toward Lousiburg, KS. The clouds darken a bit - but, the 'threat' of rain begins to evolve into a 'hope.' It's hot & muggy... and a nice rain shower would do pretty good right about now! Difficult to tell, but from the bike seat the clouds had begun to thicken, and the nearby horizon had taken on a hazy, vague appearance - rain! 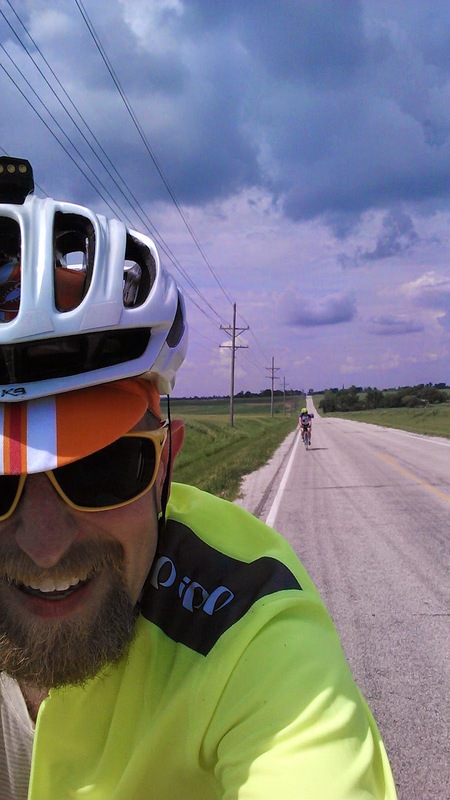 A few short climbs after our brief stop at Louisburg's Rand's c-store found us riding into a nice, solid rain shower. Ahhh - relief! The salt and sweat of the early miles washed clean, along with the toils of the workday. At least for a few miles, it was Spring again! 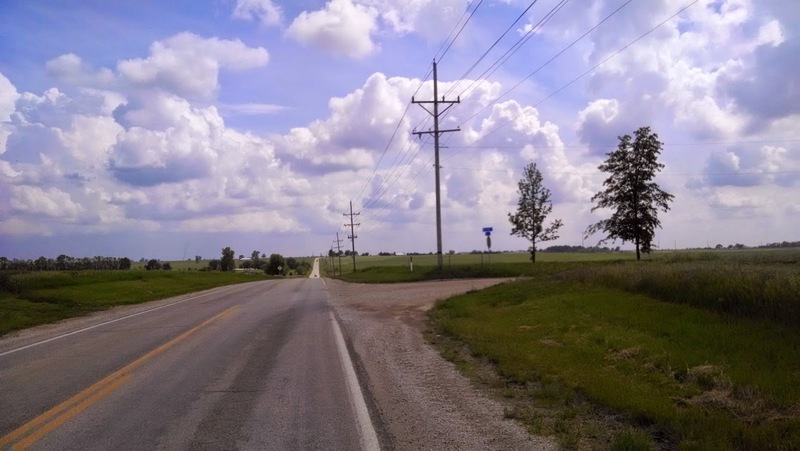 335th and Cold Water Road, looking southwest. 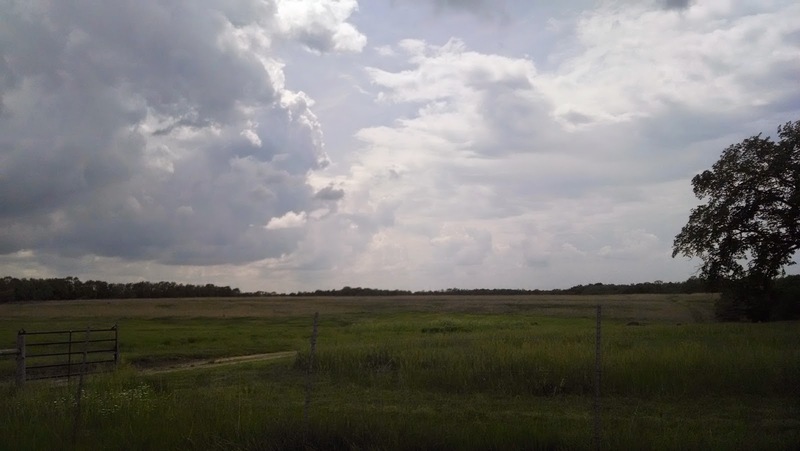 The left side focuses on State Line as it heads temptingly south towards our halfway control, while the right side shows 335th extending toward the west with Josh on the approach - epic skies above, the storms and rain eluding us for the moment. A pause for the cause, while.. I ... kick a little somethin' for the G's... and.... the party's still bumpin' cause my mamma ain't home... wait.. what? 335th and Cold Water Road... where the drinks are cold, and so are the b-boys. The mind wanders... time to ride on. 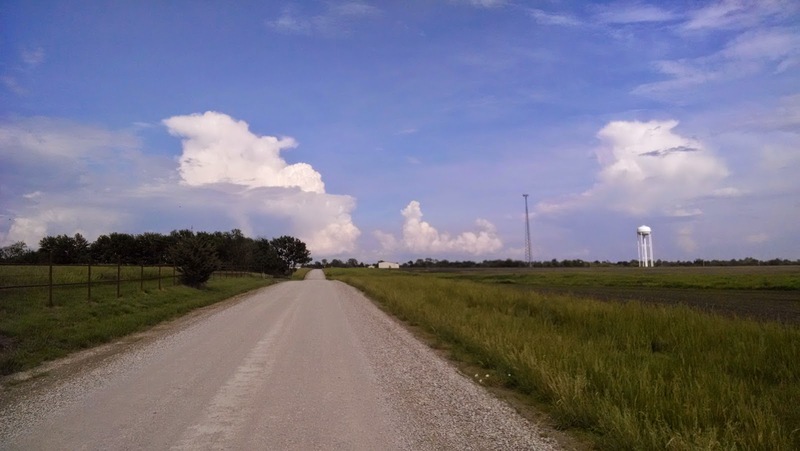 The thinning vertical ascension of the small storm cell which cooled us off earlier has moved quickly to the east, while Josh and I enjoy the gravel backroads of Cass County, MO. on the way to Drexel via the secret back-porch entry. 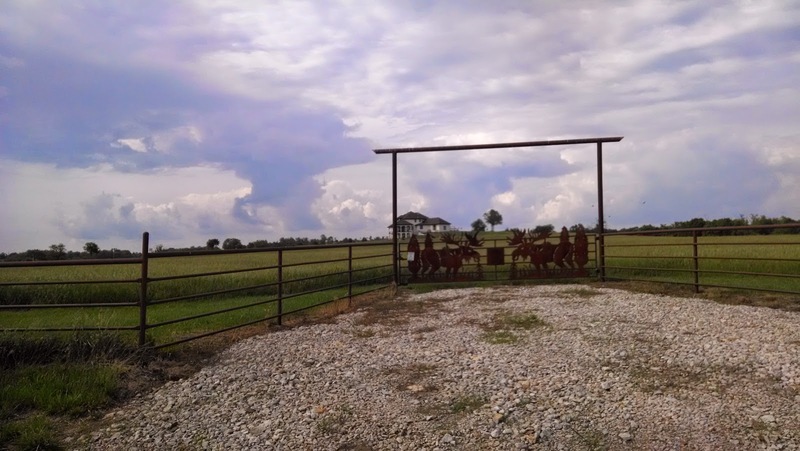 Long, unbroken lines of high-dollar fence, occasionally punctuated with ornate metal-work gates like this one, indicate the wealth of the area's legacy landowners. While I don't know any names, nor do I have many details about the true history of this particular area (yet), the large, palatial homes and huge ... tracts of land ... seem to mark a refuge of sorts for the well-to-do. Perhaps Kansas City real-estate royalty, or a BBQ tycoon, or a sports franchise owner... who knows... but all the trappings of a charmed life: well-fed cattle, private lakes & shooting ranges, all cordoned by miles and miles of fences like these. Lush, indeed - just a brief meeting, please sirs, that I might absorb a pinch of wisdom to help my dreams, too, become reality. Zowie. Some are more equal than others, indeed. 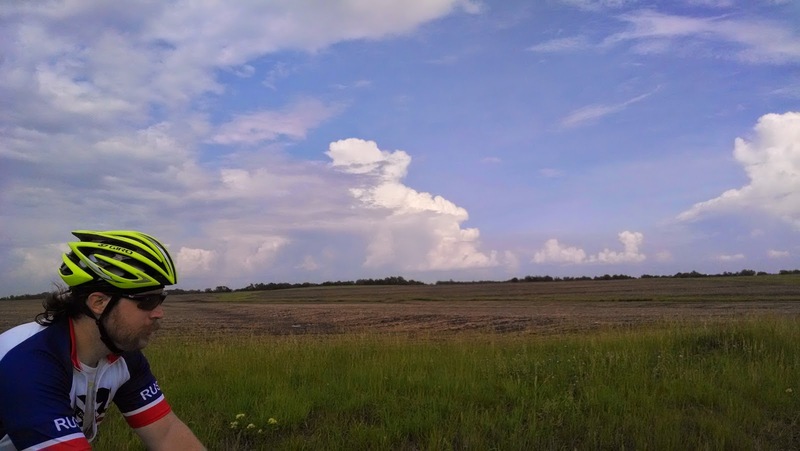 More small thunderstorm towers blossoming to the south, the entire area is fairly unstable this day - yet, thankfully, also unorganized. The humidity provides all the fuel needed, but, lift suppression keeps Josh and me relatively dry and safe from anything exciting like hail or high winds. Onward! Casey's in Drexel has donuts! A brave little aquatic friend, crossing the road - head held high. Are you threatening me? I am Gamera!! 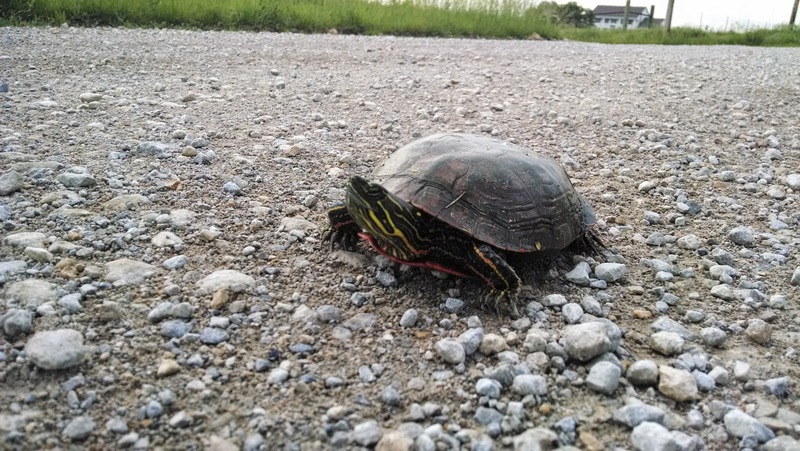 Okay, maybe he's a bit small for that action, but, this fine looking Western Painted Turtle met us on our way back across Cold Water road, as he continued his search for... uh... cold water? He's in the right place. I'm no field-guide or wildlife expert... I had to look this guy up on the web afterward based on locale and coloring, as I'd initially mistaken him for some sort of snapper. That assessment prompted me to keep my distance while getting a closer shot - while he posed proudly for the lens, not even flinching at my approach as most turtles might. He seemed pretty interested in me.. or my shoes... or my tires... inching closer as Josh and I chatted. Field-guide or not, if a creature of any sort seems fairly unconcerned with humans, is sorta out in the open, is brightly colored, and/or you just aren't sure what it is... the correct move is "don't touch!" If he instantly ducked into his shell, maybe a quick lift to the ditch toward where he'd been pointing would be in order - but, this guy seemed to be enjoying the stare-down. Also, even though we're on public roads - and not back in the bush - leave no trace, tread lightly, and leave these little friends to their business. We're the one's traveling through his neighborhood, after all. 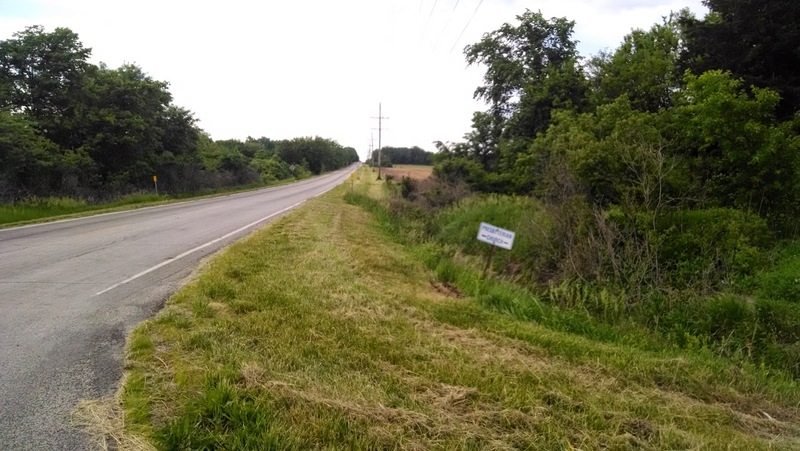 Looking north along "old US-69" (Metcalf) at 335th St. A long-forgotten roadsign off in the ditch. 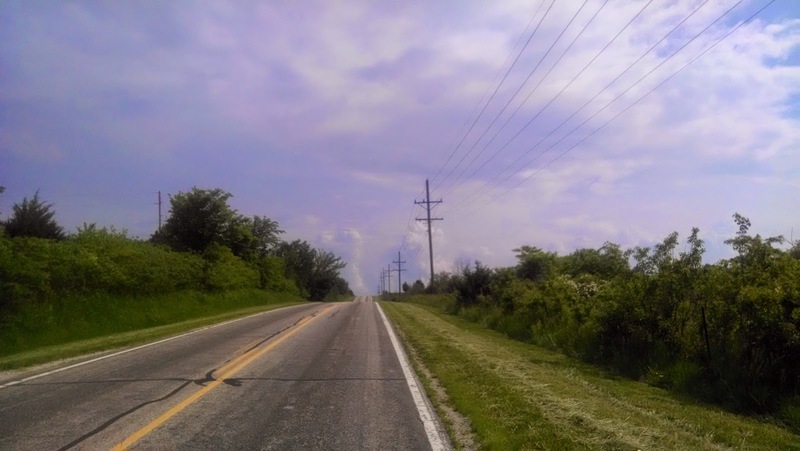 Conversations flowed as we negotiated the hills back toward Louisburg, and then continued north - skirting the last remnants of rush-hour traffic nicely, and enjoying a quiet ride. We talked about rules, routes, wheel-building, and more - and the miles came easier and easier with the mind otherwise occupied. Riding solo is great for the occasional challenge, but I always like it when someone else is out there. We encountered a few other cyclists as we traveled north back into town, more evidence of the terrific weather - at least, the tolerable cycling weather. It seems many area cyclists had been waiting for a day like this one for a while. We actually got caught by a couple friendly tri-guys out training along 179th St., and then made a feeble attempt to catch them. Sorta fun -- and we also took to a little good-natured ribbing trying to coax out of them how far they'd been riding. He,he... yeah, we're pretty proud of what we'd done, and weren't too shy to share it with local cycling's elite athletes. Silly randos. My favorite shot in a long time - the sun dipping as we knock out the last 6 miles or so back to the finishing control, Josh on point, flying the RUSA colors and looking every-bit the seasoned randonneur, with rear rack overflowing, extra water on board, and a comfortable, relaxed posture as he pedals us home, with the remnants of the afternoon impulse storms fading out as the sun's fueling warmth dwindles. Awesome ride, just awesome. There's only one way to truly describe what I'd been feeling as the sun began to set, and the final miles of 179th street slipped effortlessly beneath our wheels. Dated? Perhaps... but, as evidence would suggest... so am I. It's pretty remarkable how "short" 100km feels, and it brings credence to the potential for a P-12 streak to accompany the R-12 activities - especially considering the shorter time needed to grab the distance, and the local density of populaire-length routes (Thanks, Ron!) -- but this one, with it's exciting gravel and associated traffic freedom and scenery... yeah, I could see doing this one a lot more. Thanks for giving this route a go, Josh -- not sure I would have thought to do it on my own, and certainly not during the afternoon, to get a sunset like this one.